GOP Senate Candidate Photoshops Trump Out Of GOP Opponent's Pic To Show Him Laughing With Hillary - Joe.My.God. A Republican candidate for the U.S. Senate in West Virginia is running an ad showing his primary opponent shaking hands with Hillary Clinton — something that never happened. The ad uses a manipulated version of a photograph that originally showed his rival shaking the hand of someone else: President Trump. Evan Jenkins, a congressman from West Virginia, is running in a six-candidate primary for the Republican nomination, with the winner set to take on Democratic incumbent Sen. Joe Manchin in the fall. The GOP primary is next Tuesday. 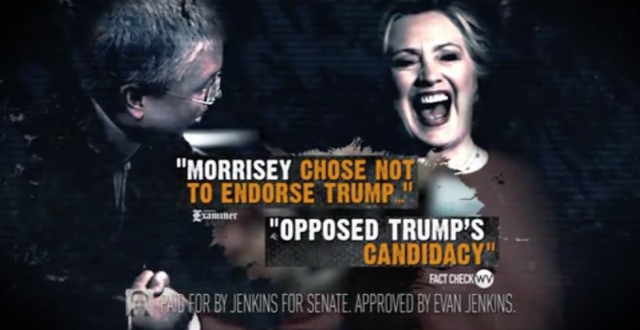 A recent ad from Jenkins’s campaign showed one of his Republican opponents, Attorney General Patrick Morrisey, genially greeting Clinton, the 2016 Democratic nominee for president. Jenkins spokesman Andy Sere told FactCheck.org that the Jenkins campaign had taken “creative license” with the ad.